When viewing a domain user list as maximized window, you can not see the last email account in the list. The screen shot here is at 1024x768. The last email account is barely visible. When viewing this on a larger resolution screen (bottom image), 1280x1024, the last item is not visible at all. All you can see is the line at the bottom and a small white space below. clicking on the empty space will bring up the user account. www.HawaiianHope.org - Providing technology services to non profit organizations, homeless shelters, clean and sober houses and prisoner reentry programs. in 2018, in just one year, we gave away 1,000 Free Computers ! Curtis, thank you for bringing this to our attention. It is a known issue and is on my bugs list. I get this in the mail archive area as well... Can that be confirmed as well? Brian, it has been noted. 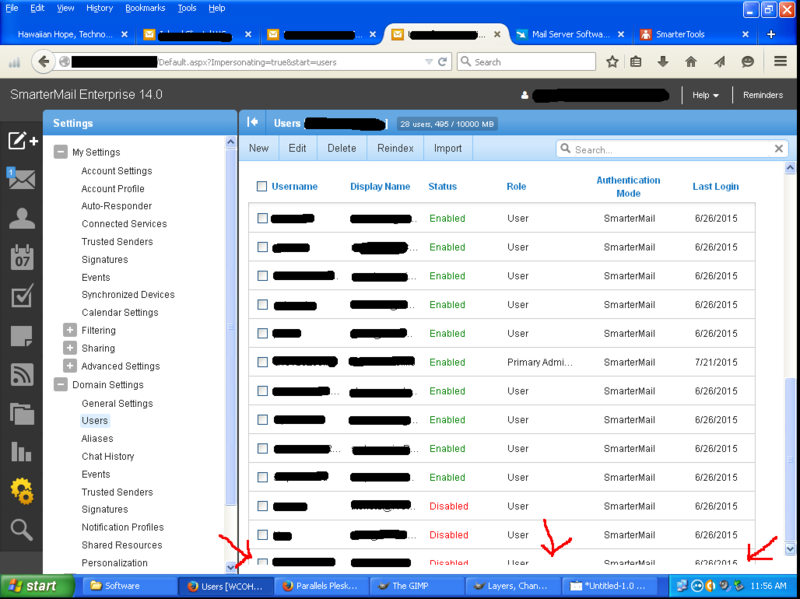 There are several places within SmarterMail where this bug is occurring. The will all be tested.